Chris Moon recently became the first amputee to complete the Badwater Ultramarathon in Death Valley. The Badwater Ultramarathon describes itself as “the world’s toughest foot race”. It is a 135-mile (217 km) course starting at 282 feet (86 m) below sea level in the Badwater Basin, in California’s Death Valley, and ending at an elevation of 8360 feet (2548 m) at Whitney Portal, the trailhead to Mount Whitney. It takes place annually in mid-July, when the weather conditions are most extreme and temperatures over 120 Â°F (49 Â°C), even in the shade, are not uncommon. Consequently, very few peopleâ€”even among ultramarathonersâ€”are capable of finishing this grueling race. For a 50 year old, amputee to complete such a grueling challenge is beyond inspiring. For more information about Chris Moon and how he lives his life, take a look at the brief video below. He’s done everything but give up on life following his near death experience. We can all learn and benefit from his example. I salute this man. His story is very inspiring. AMAZING!! That feat as you described would be an astonishing for a superfit cardio machine with four healthy limbs, but for a man with a single arm and leg it’s damn near a miracle. He certainly represents the grit and determination associated with Britian’s mascot the English Bulldog. LOVE this! He’s right, too often people set limits instead of pushing boundaries and redefining what is possible and bring what we expect of ourselves to the next level. It’s funny though, when I looked at the picture I thought “man look this guy looks determined – he is definitely proud of his country and on a mission.” I didn’t even realize that he was a amputee. He is truly leading by example. Incredible story. Great way to look at life. So brave, amazing grit and determination. Mr. Moon displays the dogged never say die attitude of his ancestors. Men like Moon where the very reason why at one time the sun never set on the British Empire. You have to say the American victory in the Revolutionary War over the Brits was kind of like the Jets over the Colts in Super Bowl III, or the Miracle Mets over the Baltimore Orioles in 1969, or maybe even Buster Douglas over Mike Tyson. The War of 1812? Hmmm, probably more on a scale of Giants over the Patriots in both Super Bowls they were matched in. An incredible man doing something that few people with all their limbs would ever be able to do. I know EXACTLY what Badwater is all about. 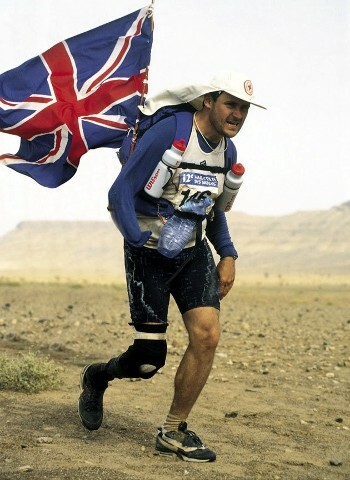 I am an Ultral Endurance athlete… This dude is amazing !! I thought the video was going to be all about Ultra endurance racing and then you find out about him facing execution in Cambodia and getting blown up by a land mine! And Ross, your website is the business.